I love spicy foods but only when the spice adds flavor with the heat. 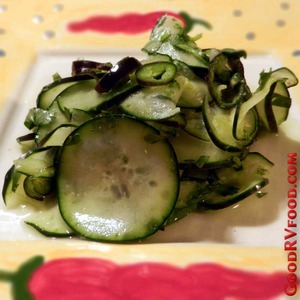 This recipe is a nice variation of a typical cucumber summer salad with a kick. It is a little sweet, a little sour and a little spicy. Add some red onion or green onion if you have some. You can tame the spice by just using one seeded pepper chopped very tiny. Or if you want extra kick use three or four peppers with the seeds. Crushed fresh garlic is much better than the powdered kind in this recipe but I don't usually have fresh garlic on hand when I'm traveling in my RV. I serve this as a healthy side dish for hot dogs, hamburgers or almost anything from the grill. In a large bowl mix the vinegar, garlic powder, sugar and salt until everything is dissolved. Add the sliced cucumber, cilantro and chiles and stir to coat all ingredients. Let sit 15 minutes, stirring every once in a while. Store leftovers covered in the refrigerator for up to several days.